Welcome to our continuing series Ghibli Rocks. Each article looking at the work of Hayao Miyazaki and Studio Ghibli as a whole. Next up GKIDS recent release of writer/director Gorô Miyazaki’s adaptation of the on the classic book series by Ursula K. Le Guin; Tales from Earthsea. If Studio Ghibli is going to survive beyond Hayao Miyazaki, the studio will have to bring the same level of care and creative intelligence that the director and his contemporaries have done for the last thirty-five years. Many have speculated that Ghibli will close its door with the eventual (real) retirement of Miyazaki. 2006’s Tales from Earthsea could give us a clue into what we could see from Ghibli if they remain open. 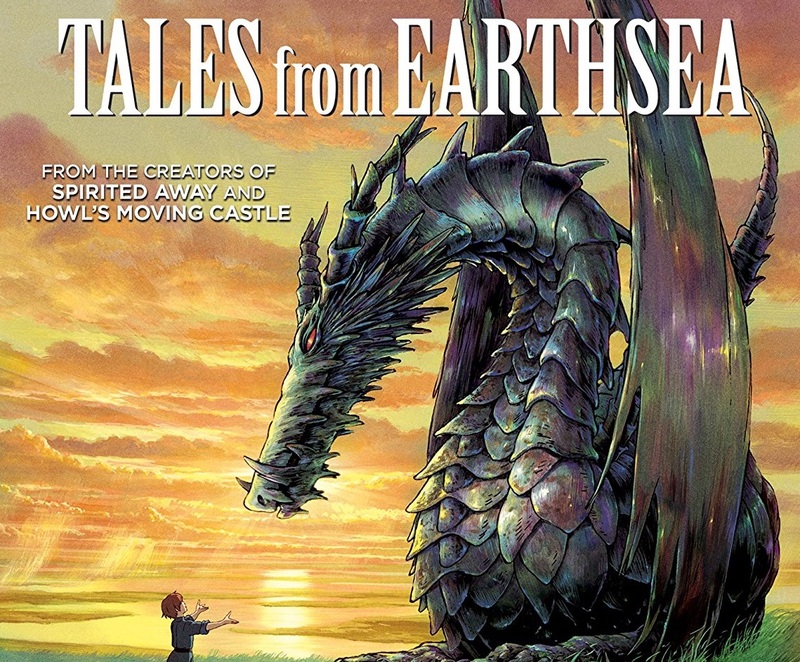 Tales from Earthsea is adapted from a series of literary fantasy novels that many holds in the same regard as Lord of the Rings, Dune, and Game of Thrones. Novelist Ursula K. Le Guin created a series of six novels and eight short stories for “young adults”. Young adult is a term used very lightly as Le Guin’s complex narrative was more focused on the adults than on the young. Le Guin’s Earthsea novels are as focused on the unsteady relationship between man and nature as anything that Ghibli and Hayao Miyazaki ever produce. It is a natural fit but one with newer lifeblood. That lifeblood comes from co-writer/director Gorô Miyazaki and the younger crew that though supervised by the elder Miyazaki seemed to have found their own footing for the adaptation. An earlier discussion of The Secret World of Arrietty. Tales from EarthseaEarthsea uses the conventions of David Copperfield and Detective Fiction. The heady brew concocts something altogether original within Fantasy in Film, albeit those who have read their share of Fantasy fiction will know this to be mash-ups that happen far more often than one would think. This seemingly innocuous choice creates a film that is unpredictable and narratively unique. Gorô Miyazaki and his fellow screenwriters (Keiko Niwa and Hayao Miyazaki) focus on the relationship between Sparrowhawk (an all-time great name) and Arren. By focusing on this relationship Tales from Earthsea gives the audience both a story that is high fantasy and low fantasy we rarely, if ever see in a film. Arren a runaway Prince finds himself on the run after a shocking event that he doesn’t know how or why happened. Sparrowhawk at first helpfully intrigued by the young man takes him under his wing. The mystery of how and why the young Prince’s actions and the even more mysterious powers that enable him to do amazing feats is what drives the narrative. This detective story creates a unique point of view into Magic and Mages which ultimately this story is about. As Sparrowhawk and Arren begin to investigate not only Arren’s nature but of the seemingly random occurrences of natural disasters, slowly introduces us to Cob. Cob, like Sparrowhawk a Mage, and his ultimate goals like the rest of the film is uniquely its own. That could be said about the ultimate showdown that ends the film. Like the entirety of Tales from Earthsea, it’s ending is both in line with other Ghibli work but distinctly its own. Gorô Miyazaki, unlike the elder Miyazaki, seems to less critical of humanity and human nature. Unlike, Hayao Miyazaki’s work, there seems to be a focus on the humanity’s good than ambivalence. This is not only what separates Tales from Earthsea from other Ghibli but feels as though what the future of Ghibli as a studio could possibly be. Only time will tell if Studio Ghibli continues beyond the elder Miyazaki’s final production; How Do You Live? With the promise that Tales From Earthsea along with non-Miyazaki films (like the aforementioned The Secret World of Arrietty and From up on Poppy Hill) brings one hopes so. This disc appears to be the same transfer from the Disney Blu-Ray. This definitely isn’t an issue as the transfer is gorgeous. The transfer is razor sharp without any grain present (which is what one wants from Animation). Also of note is just how careful they have been to ensure that there is no edge enhancement. Tales From Earthsea has a fair amount of camera movement that can be tricky for a transfer to properly represent. This transfer handles this especially well. Bravo to Shout Factory/GKIDS’ for continuing to get these transfers and encoding them perfectly. GKIDS, as was the case with Nausicaä of the Valley of the Wind’s Blu-Ray release, has created new content for this release has not gotten all the special features from the Disney Blu-Ray/DVD release. Fledgling animators and live action directors take note that the entirety of the film has been presented in Story Board format. Further making this special, these are both Gorô and Hayao Miyazaki’s own hand-drawn storyboards. It’s a fascinating watch in seeing how the younger Miyazaki composed shots and his shot selection (which have a different feel than the elder Miyazaki). These storyboards give insight into how to actually build not just action set pieces but how one creates drama through composition. All three featurettes; The two The Birth Story of the Film Soundtrack, The Birth Story of Therru’s Song, and NTV Special are Japanese TV specials released right before the film. Unlike many American versions of these type of making-of showcases the Japanese versions have much more substance. The two “Birth Story” featurettes run well over 50 minutes and are a comprehensive breakdown of everything you would want to know about the creation of the unique score by Tamiya Terashima. One would think that over 90 minutes dedicated to the music would be redundant but it is not the case. The Film Soundtrack delves deep into how important the Music was to Gorô Miyazaki and creating a European sounding score that has more in common with Lawrence of Arabia that anything else. The NTV Special is another hour-long look at the making of the film, specifically how the voice talent works on the film with the director. It’s wonderful nuts and bolts making-of featurette that looks well beyond the voice actors though they are the primary focus. The TV spots and trailers are a great addition as they include Japanese, US and European trailers and spots letting one look at how vastly different each region was marketed to. Tales from Earthsea isn’t just required viewing for Animation fans but anyone that loves Fantasy Genre films period. GKIDS continues to hit it out of the park with these Studio Ghibli releases no matter the title or the filmmaker behind the film itself. HIGHEST POSSIBLE RECOMMENDATIONS. Tales from Earthsea is available on Blu-Ray/DVD combo from GKIDS.